Cornwall is a beautiful country surrounded by waves and a landscape full of beautiful countryside and sandy beaches . Here we have chosen a selection of idyllic venues to get married at. Firstly, on the south coast of Cornwall, with Plymouth nearby and within easy access of Devon lies Polhawn Cove. This particular area of the Cornish coast is worthy of a mention, as it stands out as one of the most prominent eye catching coves in Cornwall. Set on the coastline is the breathtaking views of Polhawn Fort, it’s setting looks like a romantic scene from a Shakespearean play. Inside the Fort there seats up to 120 guests or you can take it outside into the Summer House and have a reception in the Marquee. 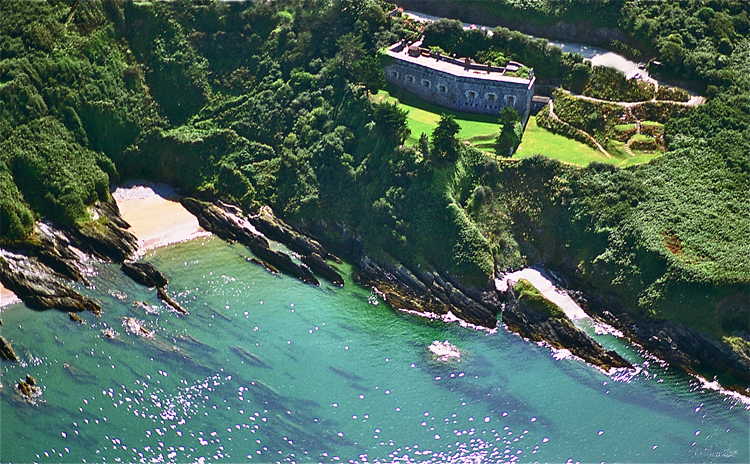 The Fort also boasts of the secluded beach, Polhawn Cove, which comes with exclusive access. If your guests fancy braving a walk the following day, footpaths run both ways from behind the grounds. You can visit Mount Edgcumbe or go further afield to Looe, Polperro, Fowey and Mevagissey. The Headland is a beautiful Hotel and Spa which were both finalists in the 2016 South West Wedding Awards. The hotel offers a number of amenities with its Golf Course, Spa and Surf School. The stunning view from the private cliff top encapsulates the Cornish coast with Fistral Beach and it’s crystal blue waters. The packages offered here cater for Hen Parties, Weddings and Civil Ceremonies. Nestled along the beautiful Cornish coastline with its renowned blue waters and soft sandy beaches you will find a number of perfect venues to hold your wedding. Hidden inside one of the bays you will find the Carbis Bay Hotel. Tucked away within the 125 acre estate you will discover the hotel that comes with a privately owned 25 acre beach to accommodate privacy for yourself and your guests on your special day. There are a team of wedding coordinators available to advise you on flowers, the menu, photography and entertainment. Alongside the wedding packages, there is also included the romantic Proposal Package where you will be assisted with anything from hiding a ring in a glass of champagne, through to writing a message in the sand and hiring a yacht. Take a wander around Cornwall and you will find Bodelva, St. Austell. In the rolling hills you will find the world famous Eden Project, where as well as conservation, outreach projects and future plans for a hotel, you can also get married. In 1995 the Eden Project began as a giant hole in the ground building up to today where you can have a wedding day to remember. There are two choices of venue, the first is the Mediterranean Biome filled with bright blooms and the aromas of citrus trees and herbs. The second is the Rainforest, the world’s largest indoor jungle. The food and flowers provided on your special day are sustainably sourced with 81% of them from local producers. As a gift from you both for your guests, each one will receive a voucher to allow them to return the following day to gain the full Eden experience. Another jewel for Cornwall away from the coast is a location for those searching for something a little different to add to their wedding day. In Mevagissey we have found just the place. Lower Barns caters for something a little out of the ordinary, from those who want to elope, to those who want just a few close friends to attend their special day. Packages cater for bespoke wedding ideas, such as Runaway for 2, Elope for 2 or a Few and Small Weddings just for 20. The Barns began as a derelict building in 1998 and has been converted into three different venues, The Wed Shed, The Shack and The Lounge. Each one has been decorated with its own quirky character giving the Bride and Groom a touch of originality to their special day. Venturing across the River Tamar in Cornwall you are about to discover a family estate steeped in history for over 300 years and tucked away from the general public if you are after a private day away from the hustle and bustle. Pentillie Castle is locked inside a 2000 acre estate to give the most of escapism for yourselves and your guests. There are various locations inside and out within the grounds. Inside you have the choice of The Morning Room or the Dining Room. Spilling outside you are greeted with the Victorian Bathing Hue and the Loggia South Terrace. PentillIe Castle is 5* establishment with fabulous grounds and interior to add the finishing touches to your photography. Dotted around the beauty of the Cornish coastlines you will find various picturesque locations. In the perfect little bay of St Austell you will find on the cliff tops a hotel that encaptures scenic views of the area taking in the breathtaking sights of the sealine and beaches. Set within 250 acres of private grounds sits the Carlyon Bay Hotel. Sitting on the cliff top gives you a private view of the surrounding area within picture perfect grounds to set a background to your photographs to match up to your perfect day. There are wedding managers on hand to assist you with every detail needing planning for your magical day, from anything to seating and name cards through to flower arranging, menus and entertainment. The bride and groom are received straight away with special treatment, being greeted on a red carpet to start your day off with a real Hollywood feel. Venturing further into mid Cornwall you will find the secluded hamlet of Trelion which overlooks the stunning Fal Valley. Cornwall is not only sought after for its coastline but also what lies further inland is just as adored, by the locals and visitors. Here we have a small, personal venue of a beautifully converted 19th century engine house called The Stack. The interior has a very rustic, natural feel to it consisting of wood and stone. It has a real house party feel to it if you are wanting something small and personal. The Stack boasts of the most comfortable beds you’ve ever had to pleasure to sleep upon and there is the Princess Bathroom to prepare yourself in for the big day. Outside there is a hot tub available for those daring enough for a dip after the service. The Stack houses up to 40 guests, and there are choices of food ranging from a sit down meal which can be hosted outside under a marquee, or if you prefer to take it outside to basque in the scenery, a BBQ or pizza cooked in pizza ovens. In North Cornwall and just 5 minutes from the coastline resides Cornish Tipi Weddings.The venue is easily accessible from Newquay airport and the train station. Tipi really is a wedding outdoors, no manicured lawns or hedges, real grassland and hedgerow, a lake with little wooden bridges and a dell. There are camping facilities if you want to really get out and sleep under the stars. The pavilion is constructed of willow and canvas to tie in with the surrounding 16 acres of private land. Expect a very earthy natural experience and setting for your private day. The venue houses from 20 to 220 people where you will be enveloped by Oak and Ash trees. Food comes in various choices with a vintage picnic or wedding breakfast up to a 3-4 course meal or hog roast with full waitress service and a wide selection of vegetarian options. Moving in central Cornwall, just downhill from Bodmin Moor, you will find a beautiful wooded valley, inside is a private estate surrounded by orchards, meadows and a lake, looking like something from a movie set. Here is a place called Upton Cross which carries within it a place called The Green. The Green began life originally as a dairy farm which has been converted into a ready made wedding village. The array of options in where to wed in this venue is astounding, ranging from the 5* house to two locations in the grounds. There is a range of accommodation for up to a 3 day stay and to house your wedding guests on your day there caters from 32 to 120 people. You can opt for a large scale wedding down to a country celebration or festival style party. The Green is also close by to the Eden Project, Padstow and Fowey, so plenty to keep your guests amused the following day if they chose to stay on after your day.